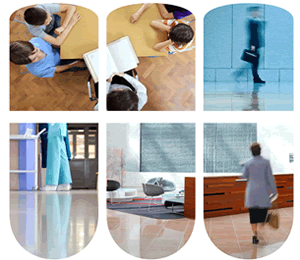 Having shining, clean floors is an important part of your housekeeping program, and the appearance of your facility. You also want durable, high performing floor care products that are easy to apply. Rochester Midland offers a wide selection of resilient floor care programs for many applications. All programs are available with training and application charts for best results. Our high performance floor care systems are designed to provide a "wet look" gloss, maximum protection and durability. Our low maintenance systems are designed for maximum durability and performance. Our flexible systems are extremely durable, but also respond well to frequent maintenance. Rochester Midland's Enviro Care Floor Care program includes EcoLogoM certified Enviro Care Floor Finish, Floor Stripper, and Enhancer. This low maintenance floor care program is designed for durability, and less frequent strip cycles to help improve the health and safety of your workers and building occupants. Click here for an Enviro Care Novus trial. All floor care programs come together with Sustainability metrics to evaluate your impact on labor, hazardous waste, energy usage, water usage, and cost impact to maintain your facility's hard flooring. Contact us to learn more about our wide range of Floor Care products and programs.